It has been almost six months since tennis legend Martina Navratilova was told she tested positive for breast cancer. On a day she considers her "personal 9-11", the 53-year-old athlete says she "was in denial for about two seconds and cried for a minute" before deciding to aggressively take on what she knew would become her greatest challenge. In 'Martina: My Toughest Opponent' CNN chronicles Martina's journey of balancing treatments, tennis, and everything in between. Narrated by CNN's chief medical correspondent Dr. Sanjay Gupta, this half-hour special gives viewers an intimate look at Martina's personal battle with breast cancer. "She didn't miss a beat. That's very Martina. She doesn't sit around wondering or fidgeting," says former professional tennis player and founder of the Women's Sports Foundation Billie Jean King. "She just gets into action. She's a woman of action. You know, the way she played was that way and that's how she is in real life." When asked where she finds strength, Martina says: "I think anybody that survives the communist system, they're pretty tough! And then being gay on top of that, that wasn't helpful. As they say, that which does not kill you makes you stronger, so I am pretty strong." Following a lumpectomy in March, Czech-born Martina underwent more than two dozen radiation treatments during a six-week period, which ended just days before she secured yet another Wimbledon title. 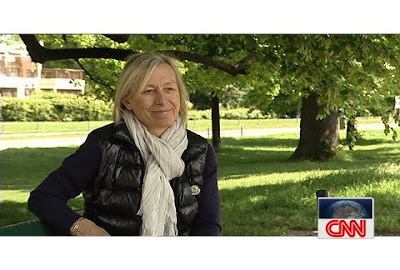 CNN cameras followed her throughout this time, capturing not only her trips to the Paris-based treatment center, but also the time she spent at Roland Garros and the All England Club playing doubles matches with Jana Novotna and working as a commentator for The Tennis Channel. When you're playing with Martina it's one thing, but when you're playing with Martina and you know everything she is going through, it's very emotional," says Novotna. Many tennis greats – past and present – were interviewed for both the on-air and online components of this special including Novotna; Billie Jean King; Boris Becker; Jimmy Connors; Steffi Graf; Pam Shriver; Tim Henman; Kim Clijsters; Lindsay Davenport; Bob Bryan; Caroline Wozniacki; Bud Collins; Francesca Schiavone; and Martina Hingis. "It is very rare to be given such extraordinary access to someone of Martina's stature," says Katherine Green, senior vice president of CNN International. "This candid program shows how Martina never lets the cancer sideline her. It is a story that is beyond inspiring." Following the launch of CNN’s acclaimed app for the iPhone and iPod touch in the United States last year, CNN today announced the availability of the international version of the CNN App on the App Store. Available free of charge to users outside of the U.S., the international version of the CNN App is purpose-built and designed to provide a visually-driven news experience for iPhone and iPod touch users who demand accessibility and convenience. Maximising the revolutionary features of iOS 4, the CNN App features push notification; regionalisation and personalisationtools; and more. The CNN app showcases important global news through text, video and photos, and also includes user-generated content capture and upload functionality through iReport, CNN’s user-generated news community. - Ability to “follow” a story or topic: As CNN publishes new stories and developments related to topics designated by the user, the app will automatically alert the user by pushing a notification to the device. - “Saved” content functionality gives users access to text stories that interest them anytime, anywhere – even when they’re offline. - Regionally-targeted news based on the user’s selection of content from Africa, Asia, Europe, Latin America or the Middle East. - Provides a direct gateway to CNN’s user-generated news community, iReport. - Lets users browse user-generated content; register, sign-in to their account or sign on as a guest to capture and instantly upload user-generated photos and videos (with the iPhone 3GS and above). - Users can also browse iReport’s latest “assignments,” asking the community to weigh in on various news stories. - Easy to navigate: Users can easily flick through news stories across categories including Top Stories, U.S., Africa, Asia, Europe, Latin America, Middle East, Business, Sport, Entertainment, Tech and Travel. - Easy to consume: Each story features bulleted highlights above the full article, designed to satisfy mobile “snackers,” allowing them to easily scan through the latest stories. - Easy to share: Users can share stories via email, Twitter and Facebook directly from the CNN App. Video on-demand: The App provides access to an extensive selection of on-demand video clips across many categories, including World, Most Popular, Sport, Business, U.S., Entertainment, Tech and CNN en Español. The CNN App is available for free from the App Store on iPhone and iPod touch or at http://itunes.com/apps. For more information about the CNN App, go to www.cnn.com/mobile. Launch advertiser Suzlon, a leading wind power company, will be featured in the international CNN App with banner ads. Brooke Baldwin is getting married! Last Friday, Robin Meade performed songs from her forthcoming album in Nashville, Tennessee. Victoria Shaw, who is producing Robin's album, showcased Robin during a show at The Listening Room Café. CNN Observations was there to cover the event. You can see our photos and videos from the event below. News of her albums release will be posted here as soon as something is announced. Stay tuned! On today's Rick's List, Rick Sanchez mentioned that his show will be airing in the 8 PM ET slot (presently held by Campbell Brown). Rick will begin his 8 PM ET post on July 22 and continue to anchor is 3 PM ET show. He will be filling in during the downtime before the new Eliot Spitzer/Kathleen Parker yet-to-be-named show will begin. This is our weekly round-up of the tidbits that didn't make it to a post of their own, but are worth noting, along with news items we may have missed during the week. If you have any of your own observations from any of the CNN Worldwide networks during the week, send us a message via the tip box bottom right. - Jon Klein defends signing Spitzer. - Profile of prominent CNN i-Reporter. - Former CNN anchor Jim Moret reflects on Larry King. - TV Newser looks at the top 10 Larry King movie cameos. - Suzanne Malveaux interviews her twin, Suzette. - Will Ryan Seacrest be the next Larry King? - Ed Henry gets married. In May, CNN Digital remained No. 1 among ALL Global News & Current Event sites in several key metrics, beating properties such as MSNBC Digital, Yahoo! News and Fox News Digital. Throughout the month, the oil spill disaster in the Gulf brought enormous traffic to CNN.com. The site served nearly 7 million live video streams in May, a 450% increase over the prior 6-month average, due in large part to a continuous live stream from an underwater camera in the Gulf. Globally over the month, CNN.com served 15 million live and on-demand video streams related to the oil spill. (VOD and Live Video data from Omniture SiteCatalyst, May 2010). In addition to video, CNN.com's oil spill coverage generated more than 70 million page views, and users have submitted 1,340 iReports with 75 vetted for use on CNN in May. * No. 1 in Total Usage Minutes: 862 million minutes, 327 million more than No. 2 Yahoo! News and 329 million more than No. 3 MSNBC Digital. No. 1 in Audience among all TV News Sites: When compared to its cable news competition, CNN Digital topped them all in terms of unique audience. With 38 million unique visitors in May, CNN Digital’s audience was 27% larger than MSNBC Digital (30 million) and 148% larger than Fox News Digital (15 million). No. 1 in Time Per Person: 22.7 minutes, the highest time spent among the top 20 News and Information sites. (Source: Nielsen Online Netview, May-10). No. 1 in Page Views: 1.3 billion page views, 92% ahead of No. 2 Yahoo! News and 106% more than No. 3 MSNBC Digital in the news and information category. (Source: Nielsen Online Netview, May-10). In May, CNN iReport received submissions from passionate users about two important assignments; remembering fallen troops for Memorial Day and first-person perspectives on the oil spill in the Gulf. Altogether, total iReport submissions increased 27% versus the prior month (11,287 to 14,346) and 16% versus the prior year (12,338 to 14,346). To date, there have been 445,745 submissions from more than half of a million (598,679) registered iReport reporters on CNN. In conjunction with the Memorial Day holiday, users submitted approximately 1,200 iReports for CNN's "Home and Away" interactive, an immersive experience which allows users to learn about and pay tribute to more than 6,000 fallen troops from more than 20 countries (May 17 - 31, 2010). In May, CNN’s “This Just In” blog, which chronicles the latest breaking news developments, including those about the oil spill disaster, received more than 24 million page views, a 17% increase over April’s traffic. As part of CNN.com’s focus on Entertainment coverage, the newly redesigned “Marquee Blog” received more than 19 million page views in May, a 22% gain over April. The “Marquee Blog” also experienced an all-time high of 1.7 million page views on May 27, the day after the launch of the new Entertainment section. Additionally, kicking off its exploration of religious angles on the day's biggest stories, CNN launched the “Belief Blog” in May. In its first 10 days, “Belief Blog” received enough traffic to place it among the top 5 most-trafficked blogs on CNN.com. Simon Cowell Brokered Piers Morgan CNN Deal? Inside Cable News links to an interview with Simon Cowell, where he claims that he knew about a deal between CNN and Piers Morgan "weeks ago". Cowell, who was interviewed by 'Extra', says he helped broker the deal after receiving a phone call from Piers Morgan.